There are five finalists this year, but expect Louisville's Lamar Jackson to prevail for the 2016 Heisman Trophy. This is the end of the line. With only a few days before the Heisman Trophy ceremony on Saturday night, players have run out of opportunities to convince voters they deserve the most coveted individual honor in college sports. Ballots have been cast. Finalists have been announced. And grievances have been aired over perceived snubs. If it’s any comfort for fans of players who’ll watch the ceremony from their couches Saturday, the decision not to extend them an invitation to New York was not subjective. Finalists are determined by point totals tied to the number of votes each candidate receives. This year five players made the cut: Oklahoma quarterback Baker Mayfield, Oklahoma wide receiver Dede Westbrook, Clemson quarterback Deshaun Watson, Michigan linebacker Jabrill Peppers and Louisville quarterback Lamar Jackson. As recently as a few weeks ago, Jackson looked like he would run away with the award. But losses to Houston and Kentucky in the last two weeks of the season definitely narrowed the gap, and Tigers star Watson made a strong closing statement by saving two of the best performances of his college career for rivalry week and the conference championship game. One note, before we take a final look at the Heisman lay of the land: The ranking of finalists below DOES NOT, in any way, reflect the Watch’s actual Heisman ballot. It is a projection of how the candidates stack up relative to one another in the eyes of the electorate. He took off running and never really looked back. Jackson has held a commanding lead in the Heisman race more or less since he bombarded Florida State’s defense with 362 total yards and five touchdowns in a 63–20 blowout at Papa John’s Cardinal Stadium on Sept. 17. Every blemish since then, including near-losses to Duke and Virginia and the aforementioned defeats to the Cougars and Wildcats, definitely hurt Jackson’s chances. And in another year with more compelling alternatives, he probably would have ceded his claim to the No. 1 spot in the Heisman pecking order by now. The problem is that nobody stepped forward to usurp him, giving Jackson a pillow-soft landing on the occasions he did stumble. That said, it would be misguided to dismiss his campaign as a product of a dearth of competition. Au contraire! Jackson was great for most of the season, even if he couldn’t continue to clear the skyscraper-high statistical bar he set leading up to that win over the Seminoles. Sure, Jackson didn’t finish on a high note, but it’s important to consider everything he did over the course of the season. Also, how fun will it be to watch him make another run at this thing in 2017? A strange start to the season in which Watson apologized for bad vibes he thought he was giving off eventually gave way to the sort of dual-threat brilliance to which we became accustomed during the junior’s emergence as one of the nation’s top signal callers last year. But Watson’s progression into Jackson’s strongest challenger was about as smooth as Google Glass’s run on the consumer market. He tossed at least two interceptions in four games, including a back-breaking goal-line pick that allowed Pittsburgh to pull off one of the biggest upsets of the season in Death Valley on Nov. 12. The thinking here is that most voters will look past Watson’s propensity for surrendering possession to the other team, but some may not be able to ignore the fact that he’s tossed at least four more interceptions than every other ACC starter. The rest of Watson’s résumé provides ample cause to think he deserves the Heisman. He is the leader of the No. 2 team in the country; he seems to elevate his game in crunch time; and he outdueled Jackson in a head-to-heat bout on Oct. 1 that effectively decided the ACC Atlantic division and a playoff spot. Some voters may have harbored unrealistic expectations for Watson this season based on what he accomplished as a sophomore, but there’s a lot to like about how he performed as a junior. The argument for Mayfield is straightforward: He is the most accurate (71.2% completion percentage) and efficient (197.75 QB rating) passer in the country. Of the five players who finished in the top seven of last year’s Heisman voting and returned this season (Stanford’s Christian McCaffrey, Watson, Mayfield, LSU’s Leonard Fournette and Florida State’s Dalvin Cook), Mayfield was the only one who considerably improved his statistics from the previous season. That didn’t seem a likely possibility entering 2016 considering he was named the Big 12’s Offensive Player of the Year in 2015, but here we are. 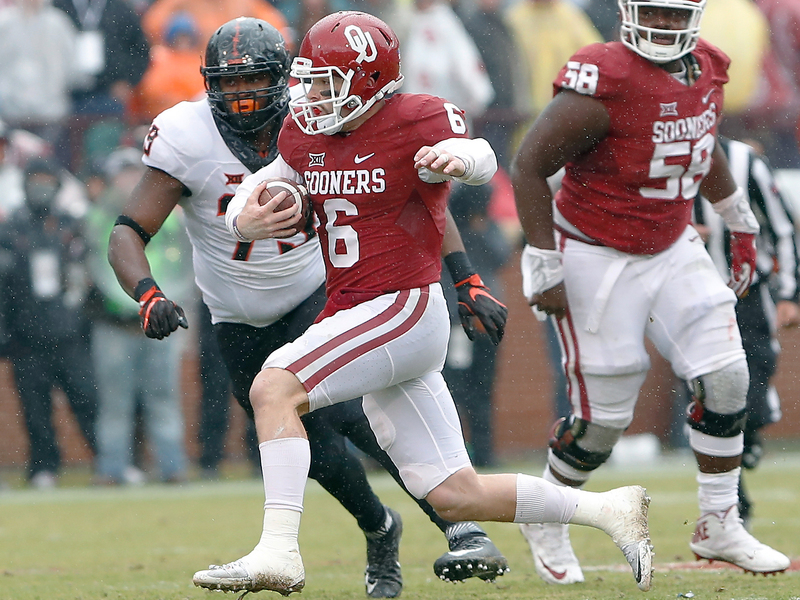 The most common charge against Mayfield concerns the level of competition. Only one Big 12 team (Kansas State) ranks in the top 40 of Football Outsiders’ S&P + ratings, and Mayfield’s worst game came against the only top-10 defense (Ohio State) he faced. Yet he lit up the Wildcats (25 of 31 passing, 346 yards, four touchdowns), he shined against Houston (No. 22 in defensive S&P+) and he was close to perfect throughout Oklahoma’s nine-game winning streak, right through the Sooners’ Big 12 title-clinching win over Oklahoma State in the Bedlam game. That defeat to the Buckeyes probably cost the Sooners a spot in the CFP, but one bad game shouldn’t override the rest of his sparkling CV. Mayfield would not have been able to assemble an unimpeachable statistical case were it not for Westbrook. A hamstring injury slowed the senior down during the first month of the season, but he’s been superb since Oklahoma’s Oct. 1 win at TCU. Over that stretch Westbrook has recorded at least one receiving touchdown in every game and at least 100 receiving yards in all but one game. Some voters may levy the aforementioned criticism at Westbrook about Big 12 defenses, but consider that he’s performed better than another wide receiver from the conference who earned consideration for the award last season, Baylor’s Corey Coleman. Over 12 games Westbrook has recorded more receiving yards and yards per catch and only four fewer receiving touchdowns than Coleman. Westbrook also has made a big impact as a return man, and his highlight reel just keeps growing. No wide receiver has won the Heisman since Michigan’s Desmond Howard in 1991, but Westbrook is one of the most compelling candidates at the position in recent memory. Perhaps the biggest obstacle for him and Mayfield is that they may steal votes from each other. Yet the practical downside of both players surfacing as legitimate candidates for the award should take a back seat to the reality that they indisputably qualify as the nation’s best offensive duo. Click here for a longer piece explaining why Peppers deserves the honor.